The anniversary of the announcement of the Higgs discovery (which happened on 4 July 2012) was hard to miss at CERN this year. 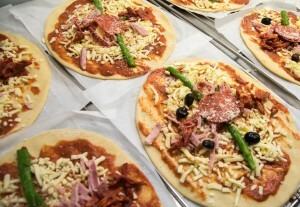 People braced waiting times of more than 30 minutes to have a taste of discovery: the specially created Higgs pizza! Two shoots of asparagus (proton beams) collide in the middle of the pizza to create a Higgs boson that then decays. For carnivores, the chorizo Higgs decays into two two high-energy photons made of salami alongside some charged ham and neutral olive particles; vegetarians enjoyed the decay of a tomato Higgs into four pepper muons and various other particles as well artichoke muon chambers. You don’t believe this? Below is the animation to prove it. Would a future ILC restaurant feature a permanent buffet of cavity tree cake? We hope so. In the meantime, remember the days when the Higgs was discovered?